When I said I was going to Germany for no reason, it wasn't exactly true. 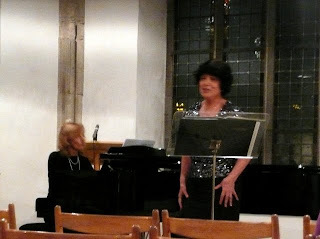 I came to hear my friend Dolores Blumenstock in recital in Ulm. 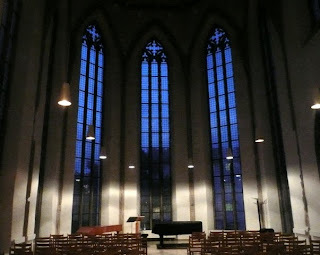 The recital took place in the Haus der Begegnung in a room that began its life as a Greek church. Two extra songs by Schubert not on the program. The recital is a remembrance of her husband who died a year ago. Unrelenting sadness can work for some people, and it did for Dolores. Normally she is cheerful. Ulm has changed a lot, but Dolores seems ever the same.